Romantic florals and intoxicating citrus with base notes of vanilla. Light, sweet, sacred perfume. Balances feminine energy and the moon cycle. Ingredients: Contains 100% pure essential oils of Rose Geranium, Neroli, Atlas Cedarwood, Vanilla, Lavender, and Frankincense in Jojoba Oil. Ingredients: Contains 100% pure essential oils of Balsam Fir, Juniper, Rosemary, Clove, Eucalyptus, and Spearmint in purified water. How to Apply: Shake well. Apply several sprays to the palms, cup hands over nose and mouth and inhale in deeply. Can also be sprayed to the throat center. Reapply frequently throughout the day to strengthen immunity and open the lungs. For external use only. A woodsy and refreshing aromatherapy that promotes focus, energy, and mental clarity. Great unisex scent that's perfect for both men and women. Excellent blend to help with studying, playing music, or other activities that require deep focus. Ingredients: Contains pure essential oils of Black Spruce, Texas Cedarwood, Rosemary, and Wild Orange in Jojoba Oil. 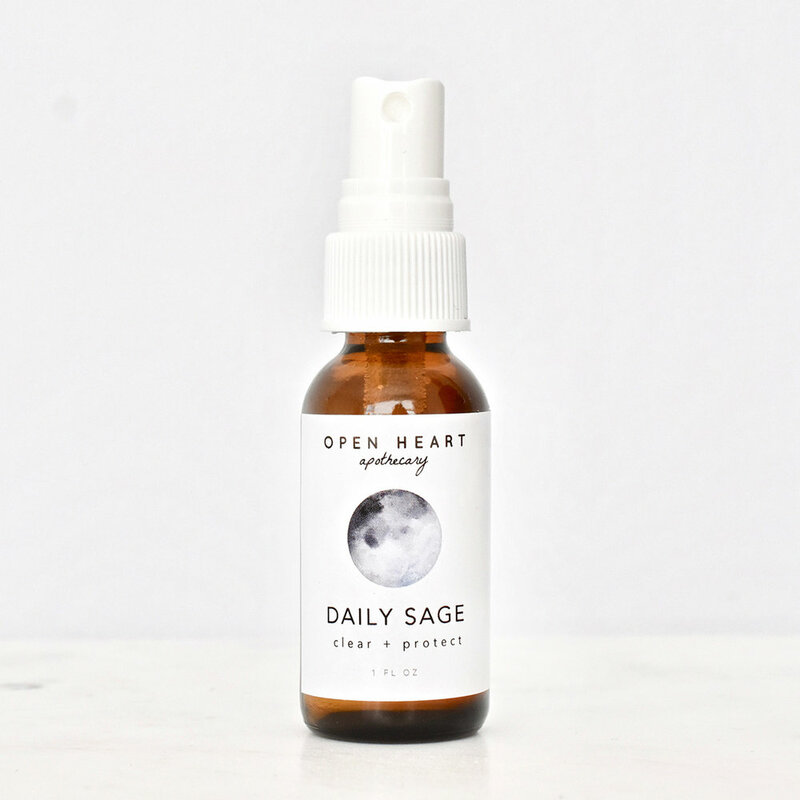 Featuring precious White Sage and Tulsi used ceremoniously to clear energy from the physical body, energetic aura, sacred spaces, and healing objects such as crystals. Help clear unwanted energy and invite fresh, positive energy in for personal transformation. Ingredients: Contains pure essential oils of White Sage, Clary Sage, Tulsi (Holy Basil), Silver Fir, and Spike Lavender in purified water. Allow yourself to drift off to sleep with this delicious bouquet of sweet florals and citrus. The perfect accompaniment to bedtime. Combines natural CBD with wildcrafted essential oils. Ingredients: Organic Full-Spectrum Hemp Extract CBD Oil, Organic Hemp Seed Oil, Jojoba Oil, Pure Essential Oils of Lavender, Blue Tansy, Elemi, Sweet Orange, and Rose Otto. Ingredients: Contains pure essential oils of Peppermint, Lavender, and Clary Sage in a base of Jojoba, Grapeseed, and Apricot Kernel Oil. How to Apply: Roll on pulse points on the inner wrist, temples, and base of skull. Reapply frequently throughout the day for inner peace. External use only. Ingredients: Contains pure Lavender essential oil and Jojoba oil. Ingredients: Organic Full-Spectrum Hemp Extract CBD Oil, Organic Hemp Seed Oil, Jojoba Oil, Pure Essential Oils of Vanilla, Cardamom, Spikenard, Ho Wood, and Lavender. Ingredients: Pure essential oils of Grapefruit, Fennel, and Roman Chamomile in a base of Jojoba Oil. Breathe deeply and heal with a potent blend of essential oils that promote healing on the cellular level. Deeply meditative, earthy, and spicy blend that will uplift the body, mind, and spirit. Charged with love + moonlight. Ingredients: Sea Salt, Essential Oils of Tulsi (Holy Basil), Frankincense, and Clary Sage. How to Use: Open the cork top, close your eyes and inhale the scent to heal, harmonize the body, mind, and spirit. Reapply frequently throughout the day for inner peace. External use only.